Are you planning to add a dog to your household and wondering what breed to choose? Although many breeds are praised as "good with children," there's no one-size-fits-all answer to this question. Your neighbors across the street may love their labradoodle, but that doesn't mean you should get the same breed. You might find it surprising to hear that in general all dog breeds are good with children. Virtually all Rottweilers are gentle with children and never bite. Very rarely is a child seriously injured by a dog. But, for those parents who want to be extra safe we have removed the breeds that are most frequently involved in attacks from this list. Keep in mind that any dog that is teased or treated harshly can bite. You should teach your children to be respectful of the dog and to treat him gently. You should always supervise young children when they're with your dog. The best way to have a family friendly dog is to ensure that the dog considers every human member of the family as its pack leader. The great advantage of bulldogs? The Bull Dog has a sturdy build that is perfect for kids who like to roughhouse. The Bull Dog is comfortable living in large houses, as well as apartments. However, it won't win any awards for "most energetic dog." A docile, friendly, and loyal dog, it gets along well with other pets and dogs, too. If you don’t mind a bit of high maintenance when it comes to brushing and bathing, Charlie Brown’s best friend is an ideal dog for families with children. Energetic and friendly, beagles are also sturdy and mostly child-proof, and your kids will wear out before they do. They also make good nannies that can help you herd the young ones at bed time, and have endearingly humorous habits, like howling, which can be very amusing in small doses. Originally kept as hunting dogs, Beagles fit well in homes with active kids, as they are sturdily built and never too tired to play a game. Friendly, clever and cheerful, the Beagle usually gets along with other pets. Often mistaken for the larger Pitt Bull, the Bull Terrier was bred to be a companion dog--friendly and loving towards grown-ups and kids alike. This well-framed dog also has a high threshold for pain, making it perfect for rambunctious children who are learning how to properly treat dogs. Particularly suited to large families, they don’t complain too much when manhandled by children, and can actually help teach kids how to properly relate to dogs. Plus they’re just very cute and adorable. While they are energetic and require lots of play time, they will also help wear your kids out — the more the merrier — and will return the favor by being very protective of them. This is the dog Lassie made famous. 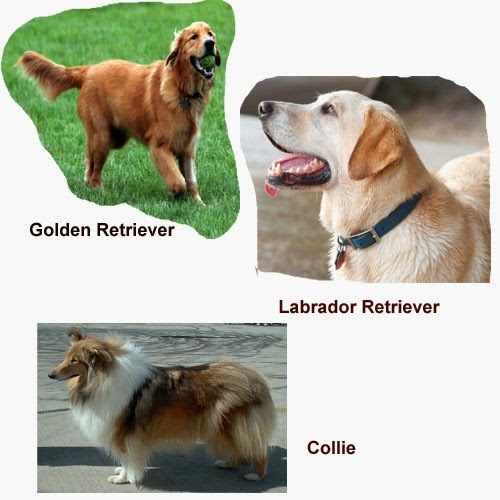 Collies are a very gentle and predictable breed, rarely biting its human family and easily trainable, perfect for families that are unfamiliar with dogs. While its long coat is high maintenance, its tendency to herd your children may be useful, at least in their early years. Beyond that, collies love nothing more than to make their humans happy, and it’s really not a stretch to imagine that you could train yours to alert you to a fire in the barn, or to remind you that you’ve left your cell phone on the dining room table before rushing off to work with a well-timed bark and whine. Sadly, though, no one has yet been able to train this breed to cook. The Collie's long hair means it requires regular grooming to keep its coat in tip-top shape. 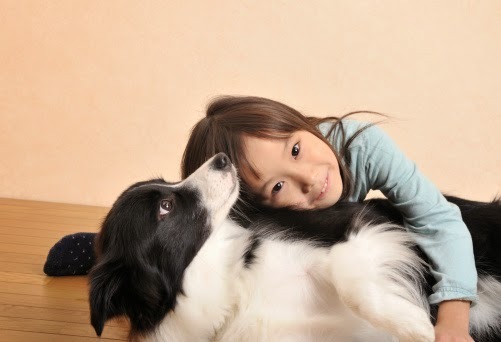 Collies get along great with children and love to please their owners and protect their family. Although it is known to drool and shed excessively, it is not considered a proper dog for the yard. This breed wants to be inside with its family. Wouldn't you? The Newfoundland is also a great swimmer and has been known to save lives in emergency situations. Both young and old will quickly fall in love with this wonderfully sweet, large dog. Additionally, it is obedient, confident and smart, forming close bonds with its family and able to learn new tricks quickly. Best of all, the Vizsla has very little "doggy" smell about it. A better choice for families with yards because of their energy, Irish Setters are wonderful with children, because they are playful and energetic. One word of warning, though — their life spans are among the shorter ones for larger breeds, so you should only choose an Irish Setter if you want to teach those inevitable life lessons while your children are in middle school. Twelve years is considered old age for the breed, and few make it to fifteen. A smart and trainable companion, the Irish setter is perfect for people with lots of space. Please note, only the standard poodle is a good family dog. Miniature poodles tend to be very high strung and not suitable for families with children. Standard poodles are smart and gentle, and are good for children with allergies, as they do not shed as much as other breeds. Otherwise, they are good-natured, and make excellent playmates for children. This is a proud and elegant dog that is both caring and loyal. Seldom annoyed or bored, the Poodle's friendly demeanor, good nature, and patience make it an excellent playing partner for any child. One of the most popular breeds all around, we have documented Labradors elsewhere as the best dog to have if you’re looking for a date, the only breed accepted for training as arson dogs, and one of the more popular breeds for service dogs. For a family, there’s hardly a better choice. Labradors love to please their humans, being playful, protective, loving, and reliable. There’s nothing that a Lab loves more than to show off by learning a new trick, even if they manage to learn that new trick before you’ve taught it to them. They are canine Einsteins. Not as big as the Lab, the Golden Retriever is a kind, smart, confident, and loyal dog. 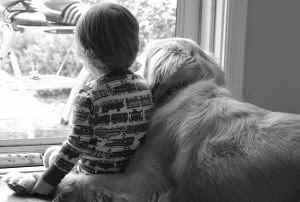 Neither aggressive nor timid, the Golden Retriever is extremely patient, which is perfect for kids. While it does need a lot of exercise, its love of play makes this an easy thing to achieve. Their main asset is extreme patience, useful around children, as well as their high energy. Frequently used as service dogs, they were originally bred as gun dogs and are avid swimmers.